Shannon Brown from Our Table Catering made a Carrot Cake Cheesecake. To learn more about Shannon's catering services visit www.ourtablecatering.com, call (615) 584-3048 or follow her Facebook at www.facebook.com/ourtablecatering. Prepare the cheesecake layer first. This should be done early in the day or the night before so the cheesecake has several hours to sit in the freezer and get completely firm all the way through. Preheat the oven to 325 degrees. Prepare a 9-inch springform pan by wrapping the outside with aluminum foil high enough on the sides to keep the pan dry in a water bath while baking. Line the inside of the pan with a piece of parchment paper cut to fit the bottom only. Beat cream cheese and sugar with an electric mixer until smooth (about 4-5 minutes). Add in salt and eggs (1 at a time) and mix until smooth after each egg. Add sour cream and heavy cream and mix until light and fluffy (about 2 minutes). Pour into the prepared pan. Place the filled springform pan into a larger baking dish with about 1”-2” of water in it. Make sure the water goes only about half way up the sides of the springform pan but below the top of the aluminum foil wrapping. Place it in the center of the oven and bake for 45 minutes. Then turn the oven off and let the cheesecake sit in the closed oven for another 30 minutes. Remove from the oven and allow to cool on the counter. Then remove the sides and put the cheesecake in the freezer for a minimum of 2 hours. Preheat the oven to 350 degrees. Grease and flour two 9” cake pans. In a large mixing bowl, combine sugar, oil and eggs until blended. Add in all remaining ingredients EXCEPT the carrots. Beat for about 2 minutes until everything is well blended. Add shredded carrots and stir until they are all mixed in. Pour (evenly divided) into the two prepared cake pans. Bake for 30 minutes. Remove from oven and cool on a wire rack for 10 minutes. Remove the cakes from the pans and allow to cool completely. In a large mixing bowl, combine cream cheese and butter. Beat with a whisk attachment for three minutes. Add in sugar, vanilla, and heavy cream. Beat for 3 to 4 minutes until light and fluffy. Fold in chopped pecans (optional). Set aside. Put the first layer of carrot cake on a cake board. Add the cheesecake layer. 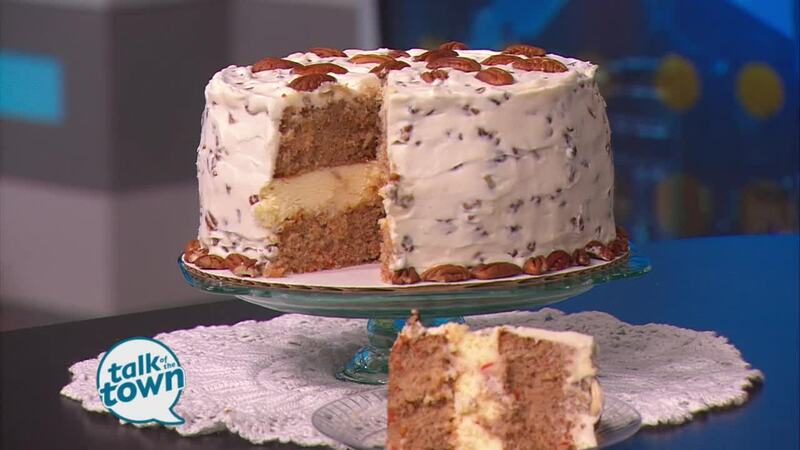 Top with the second layer of carrot cake. Then, icing the whole cake starting with the sides and then the top.